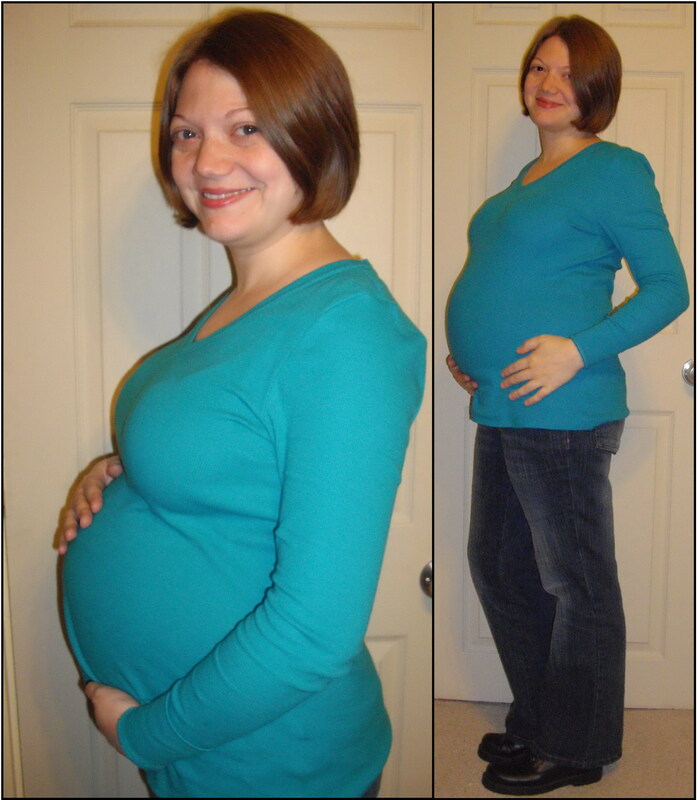 I hit the 28 week mark on Sunday, so I’m now officially in my 3rd trimester! 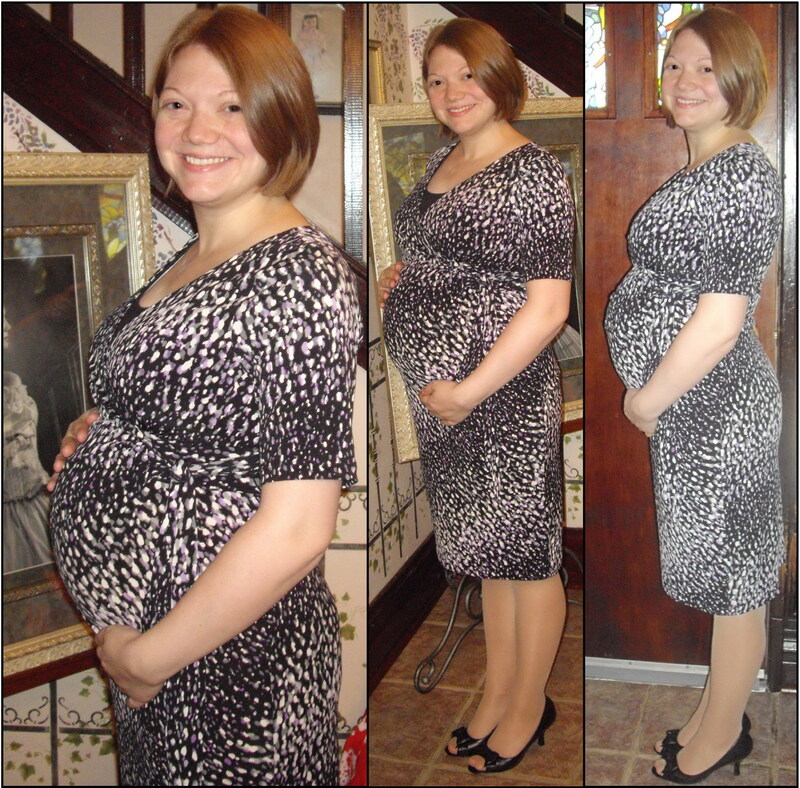 Here’s what I’ve been up to (pregnancy-wise) during the past 8 weeks since my last update. I was 20 weeks on 09/18/2011 and the following day we found out that our little one is a boy! 🙂 A few days later I had a prenatal appointment. Everything looked good and baby’s heart rate was in the 150s. On 9/30 I turned 32. 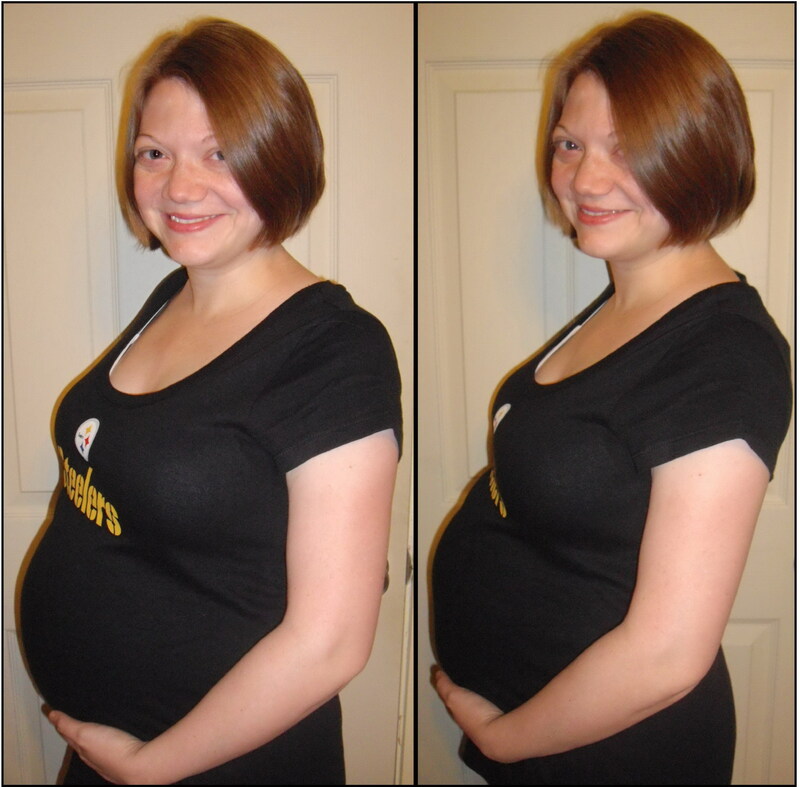 That has nothing to do with the pregnancy, I just never bothered to blog about it and thought I’d mention it. It’s also a cruel joke that my wedding photo is visible in the background when I was 8 years younger and 40ish pounds lighter. Around 23-24 weeks the rib and back pain started. It’s only the right rib (mostly when I sit working at the computer desk for hours) and my back pain is on the upper right side. 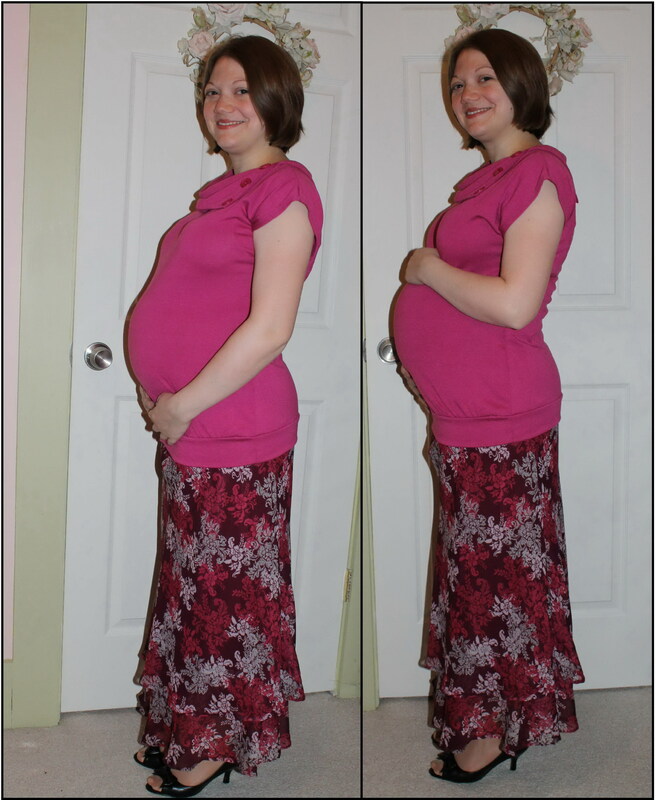 I had the same pains only on the same side while pregnant with Adaline, however the pain with her was more constant. Click here for more photos of me in the pumpkin shirt. You know you want to. Around 24 weeks I had another OB appointment. Baby’s heart rate was good again although they didn’t tell us a number. Adaline came with us to this appointment and the OB I was meeting this time was the one that delivered Adaline in 2009. Adaline was a very good girl during the appointment. This OB (who I’ve taken to calling Dr. Sunshine…sarcastically) spoke to me briefly about my desire for a VBAC. To make it short she basically said that I can try for a VBAC but that my daughter was a big baby and chances are this baby will be big too and I may end up with another c-section. Mmm-kay. 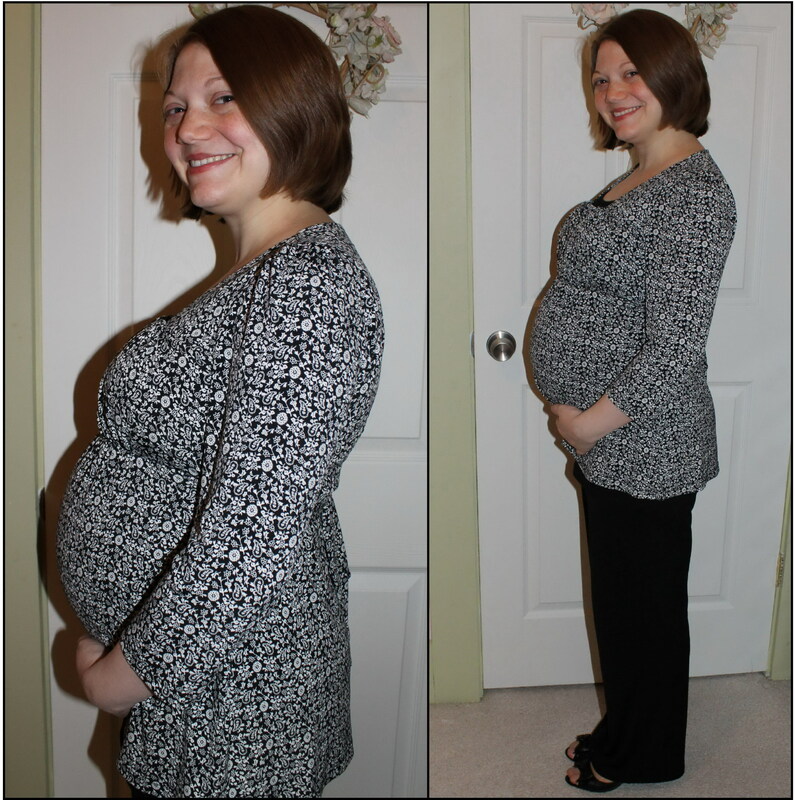 At my 24 week appointment I wasn’t thrilled with my 7 pound weight gain, although no one seemed concerned with it. 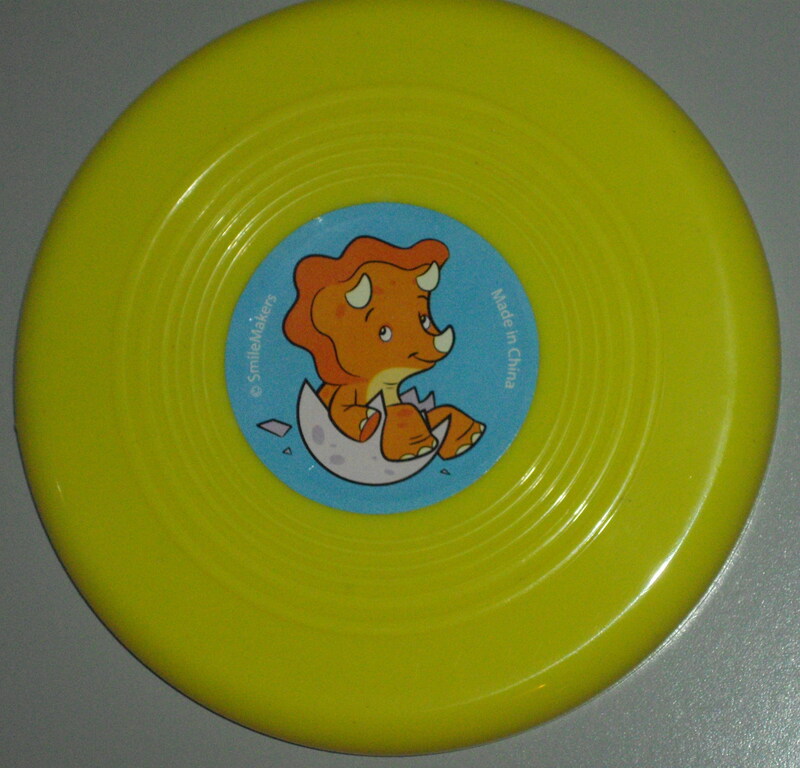 I started doing some prenatal exercise dvds. In the past four weeks I’ve done 8 days of prenatal aerobic, 5 days of prenatal sculpting/strength, and 5 days of prenatal yoga. I can only work out once Adaline is in bed so I don’t have a real schedule going yet, but my goal is to do aerobics 5 days a week and strength and sculpting 3 days a week. For weeks now my weight has stayed the same (although my belly is definitely growing) but all of the sudden yesterday I weighed in 5 pounds heavier than the rest of the month! Seriously, 5 pounds in one day? I hope my scale’s just wonky. Last Tuesday I had my 1 hour glucose tolerance test. The stuff that they gave me to drink was a bright red fruit punch flavor. I decided to check the ingredients while I was drinking and sure enough there was the artificial color Red #40 in it. That kinda really irritated me. I’m a grown woman who could care less about the color of the nasty stuff you’re making me drink. Is it really necessary to put fake junk in my body so that we can all pretend that it’s red? I don’t get it. Anywho, I’ll get my results at my OB appointment tomorrow. 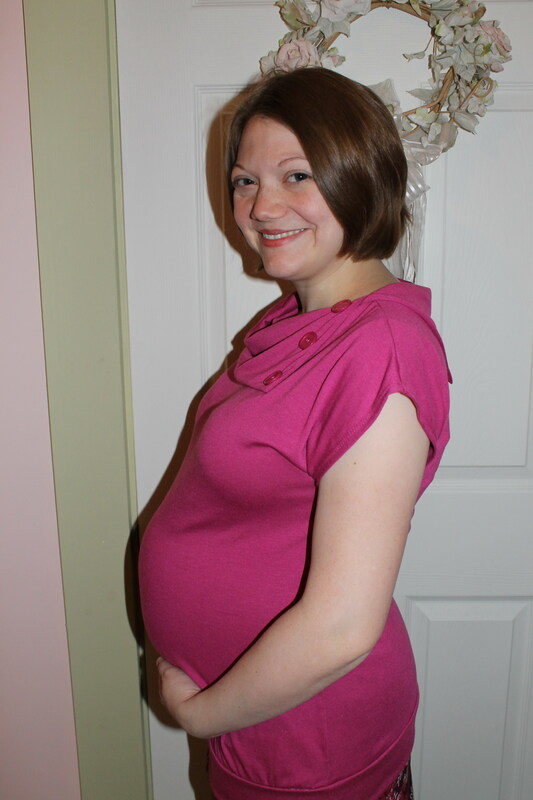 This month I interviewed a couple of doulas and I made a decision over the weekend. I’m so excited about having doula for this birth. It makes me feel much more confident that I can achieve a successful VBAC. Yay for me! 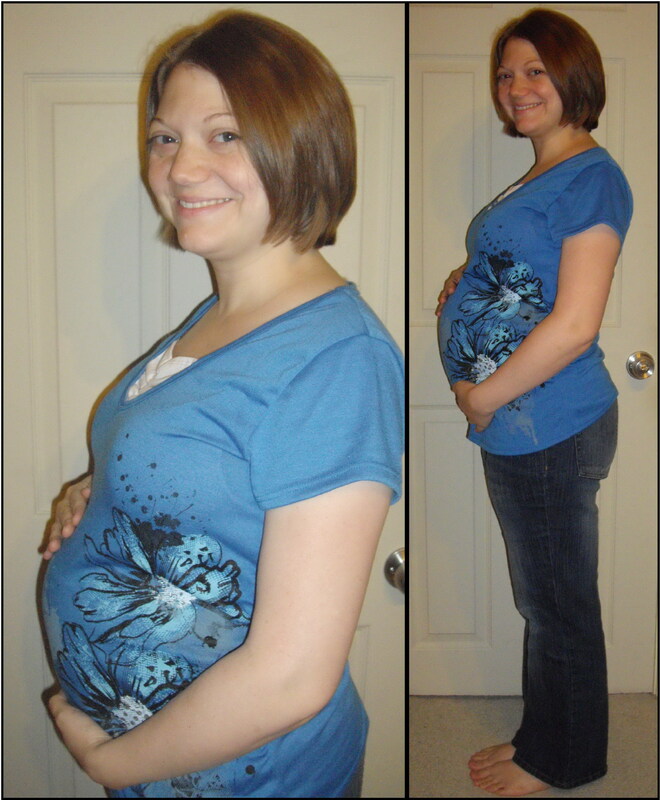 Posted on November 16, 2011, in Jenn, Jonathan, Pregnancy and tagged 2nd trimester, pregnancy. Bookmark the permalink. 7 Comments. Great pictures!! I’m very happy for you and your family!! You will love having one of each, it is a blast!!! Be well! I love all these pictures of you!! 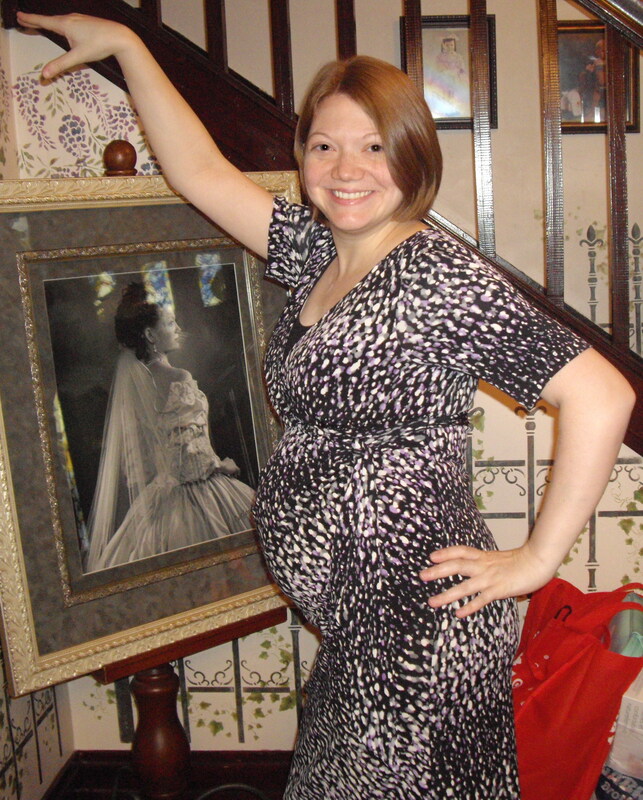 I loved being pregnant. I wish I had more pics of it! IT’S A BOY! That is so exciting! Have I told you how much I love that pumpkin shirt?? I hope you are able to have a VBAC. I had to have 2 c-sections, and it was no fun, but I was older than you and maybe that had something to do with it. Thank you for all the awesome comment love you gave me today! I also can’t believe you’re as far along in the pregnancy that you are. Where does the time go? The same place that my missing socks go after they’ve been washed? Very cool post! 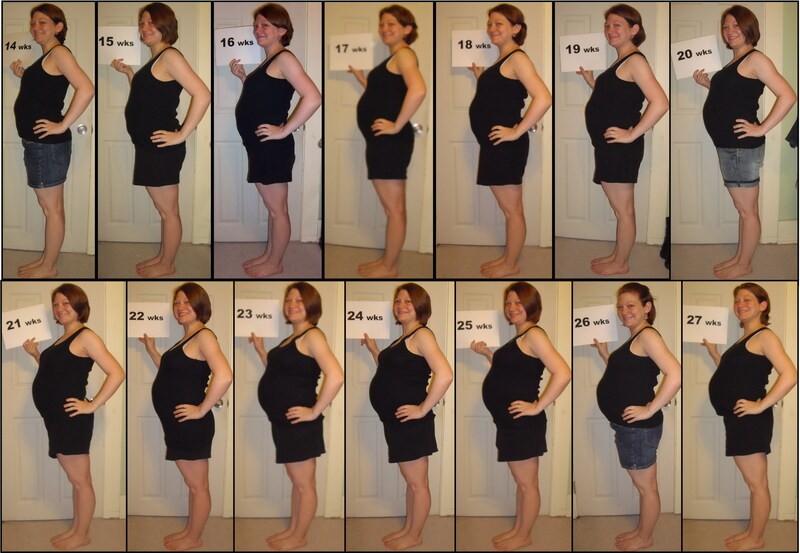 I love all the bump photos. 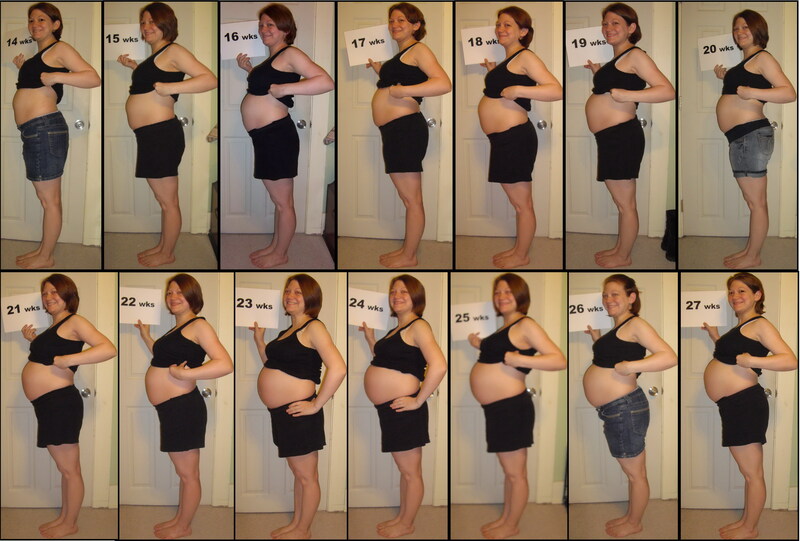 What a great way to document your pregnancy. I was reading through all of your local events and I have to say I am a bit jealous! We have a few things where I am from but nothing like all the stuff you posted. Wow! I know this is an old post but I’ve just got to say that i LOVE the fashion show and the pumpkin shirt is hilarious. Good luck in the new year to you and your entire family!